LONDON, Dec. 18 /CSRwire/ - A new report released by the Network for Business Sustainability (NBS), a research group based at the Ivey Business School, reveals the 39 practices businesses can use to foster innovation. Based on a review of more than 127 studies from the last 20 years, this guide for executives provides tangible, real-world practices to reduce costs and drive revenues while improving impacts on people and the environment. It also includes a 3-stage framework for business leaders to assess their progress. “The majority of the companies we reviewed fell in Stage 1, which emphasizes using technological fixes to reduce harm. Examples of “techno-fixes” include incremental innovations like waste diversion and energy efficient lighting,” said Dr. Richard Adams, University of Exeter, UK and lead author of the report. “But the 39 practices in this report can help companies maximize innovation at any stage. Examples of more radical innovations include replacing your products with services, selling your garbage to other companies, and collaborating with competitors, lobbyists and environmental groups - the same organizations normally seen as antagonists. This report addressed one of the 2012 Top 10 Canadian business sustainability challenges identified by NBS’s Leadership Council – an exclusive group of 18 Canadian organizations recognized for their leadership and commitment to sustainable business. To arrange media interviews please contact Ivan Langrish, Senior Manager, Media Strategy at 416-203-0664 or ilangrish@ivey.ca. 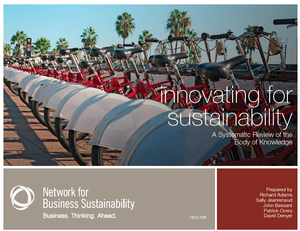 The Network for Business Sustainability is a Canadian not-for-profit organization that connects thousands of researchers and business leaders worldwide, with the goal of creating new, sustainable business models for the 21st century. NBS receives funding from the Social Sciences and Humanities Research Council of Canada, the Richard Ivey School of Business at The University of Western Ontario, École des Sciences de la Gestion at the Université du Québec à Montréal and industry partners. BC Hydro, Canadian Pacific Railway Limited, Environment Canada, Home Depot of Canada Inc., Holcim (Canada) Inc., Industry Canada, LANXESS Inc., LoyaltyOne, Inc., Pembina Institute, Research In Motion, SAP Canada Inc., Suncor Energy Inc., TD Bank Group, Teck Resources Limited, TELUS Corporation, Tembec Inc., Tim Hortons Inc., Unilever Canada Inc.